It is a really good idea to keep an eye on what you are for. Otherwise, you will make important decisions based only on what you are against. Ordinarily, that doesn’t work out well. It doesn’t work out well for persons, for societies, for nation-states. It’s just a bad idea. That brings me to Divergent, the book and the movie. Not my kind of book or movie, I will say. It is a coming of age in a post-apocalyptic society movie. I have done all the coming of age movies I will ever need, but I have an abiding interest in post-apocalyptic societies and this one is set in Chicago after something really bad happens. We don’t find out what. What we do find out is how the resultant society has organized itself and why. And that’s why it matters to me. My entire academic life has been spent wondering how people explain the causes of events and in looking at the effects those explanations have. Since this process involves attributing causes to events, we call it causal attribution. So…was the test really too hard or did you not prepare adequately? To which of these potential “causes” will you attribute the outcome? Were you driving too fast or is the speed limit set unconscionably low? Your choice again. Is she really as generous as she seems or is she “doing the right” thing as long as she needs to? Causal attribution. Obviously, in these three examples, you would want to remedy the difficulty by doing one thing or the other. You would be guided by what you thought best explained the cause of the difficulty. There is a major flaw in proceeding that way, because it imagines that dealing with the cause of any particular failure is the best thing to do. Often there are better things to do, but we’ll have to pass that one by for today. The movie, Divergent, doesn’t say how the five factions that make up their society were formed; it just says what they were. The book, however, says why they were formed and at this point in the essay, you will not be surprised to learn that each faction is based on a different causal attribution. Decades ago our ancestors realized that it is not political ideology, religious belief, race, or nationalism that is to blame for a warring world. Rather, they determined that it was the fault of human personality—of humankind’s inclination toward evil, in whatever form that is. They divided into factions that sought to eradicate those qualities they believed responsible for the world’s disarray. Notice the negative orientation already. Some qualities have been bad and they need to be “eradicated,” i.e., uprooted. If you do bad things to these bad traits, all will be well? Really, how likely is that? And each faction has a positive sounding name, as if this virtue is to be the cohesive force of that faction. It isn’t true, though. Each faction is united by what they reject. And, of course, they reject different things. Those who blamed aggression formed [the faction named] Amity. Those who blamed ignorance became Erudite. Those who blamed duplicity created Candor. Those who blamed selfishness made Abnegation. And those who blamed cowardice were the Dauntless. If they were really factions organized to pursue those virtues, they could be called –note the new order— amity, candor, abnegation, dauntless, erudite. But they are not. 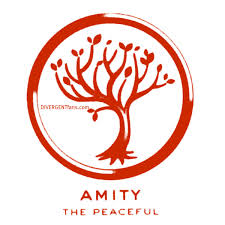 “Amity” should really be called Nonaggression. 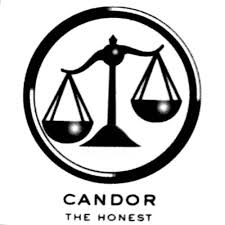 “Candor” should be non-duplicity. “Abnegation” should be unselfishness. “Dauntless” should be un-cowardice. 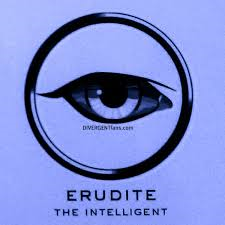 “Erudite” should be un-ignorance. If it is really true that they are given over to blaming the negative traits and to explaining how their earlier society came to grief, they really should use those ugly names. That wouldn’t make the story better, but I think it might help readers/viewers ask how factions formed by the principle these are will know when they are done. 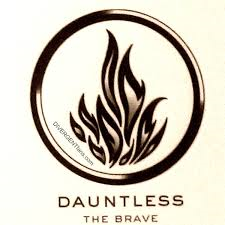 If being “dauntless” means only “refusing to be daunted,” then the faction will not be daunted, even when it should be. It will not have the reck it should have; it will be reck-less. It will not know when to stop. It will not know when the welfare of the whole will be improved by adding more knowledge, rather than more bravery. It will be a guided missile with no target. I don’t think that sounds promising. That is the end of the reflection I had in mind. I should be done now and so should you. But that last line about “a guided missile with no target” sounded very familiar to me and after a little thought, I realized that it sounded to me like the Tea Party. The Tea Party—more precisely, the Tea Party faction of the Republican party—is a faction like the ones in divergent. They are against things. They are –un. They are un-Democratic, certainly. The Democrats spend too much money here at home and favor higher taxes so they can afford it. They are un-Republican, for sure. Primary after primary, the Republican candidate has had to argue that there should be bipartisan debate in Congress, which will require that there be Republicans in Congress. The Tea Party has said no. There is no question that they are un-conservative. They are a party of national nostalgia in the Ozzie and Harriet sense and in the Horatio Alger sense, but they are not trying to conserve anything. They are un-liberals too, in most senses. Sometimes there is a libertarian moment that attracts a Democrat’s attention, but it is very narrow and the votes aren’t there. 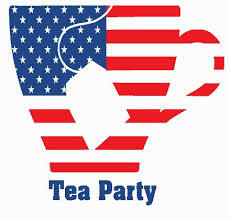 The Tea Party is a faction, like the un-Cowardice and the un-Ignorance factions. If you see the movie, you’ll see the connection. The new order comes very very close to the acronym ACEDIA, missing only the I. That would be cool, because it would spell acedia. The Greek form is acedia, “heedlessness.” The drivenness away from the negative value is just what the Greek word has in mind and it gets even better in German, where it is kin to the Old High German rocha, “care,” which becomes reck in English, and then reckless. We tend to say indomitable, taking it straight from the Latin verb domitare. The daunt- form comes from Latin to English through the Old French. This entry was posted in Books, Movies, Political Psychology, Politics and tagged attraction, causal attribution, Divergent, fanaticism, post-apocalyptic societies, repulsion. Bookmark the permalink.